You are here: Home » Ho-Ho-Holidays are ahead! Sure, you’re still stocking up on pumpkins and trick-or-treat candy — but the winter holidays will be here before you know it. It’s really not too soon to start thinking about ordering holiday gifts for your employees and clients. Holiday gifts are a great way to remind employees about how much you appreciate them and the hard work they do all year long. And for clients, these year-end treats are a nice way to say thanks for supporting your business. The old saying, “It’s the thought that counts,” still holds true here, too. Whatever your budget, there’s always something extra you can do to show you care around the holidays. Your message can be something as simple as a custom note card with a handwritten message, or as elaborate as a customized high-end gift, such as a leather portfolio, a warm blanket, or a winter jacket. And never underestimate the power of edible goodies, especially during the holidays. Flavored popcorns, cookies, candies, chocolates, or even a collection of coffee blends or teas packaged in a custom mug. Whatever holiday treat you want to share with your employees or clients this year, we can help make it happen. Just give us a call and we’ll help make your idea a reality. Tech is all the rage these days, and there are some really clever and useful gift ideas that relate to today’s technology. 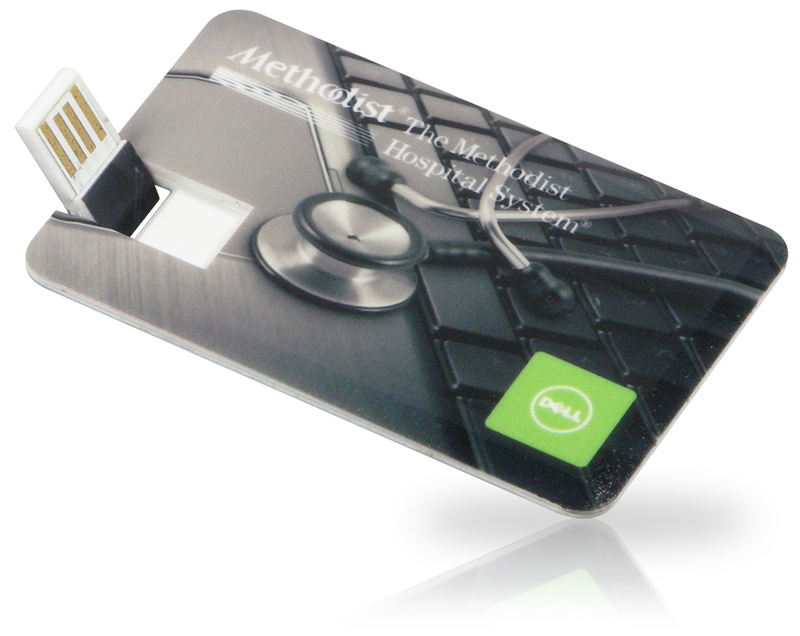 One of our favorites is this credit card style USB drive. It’s got all the great usefulness of a standard USB drive, but a unique style that most customers haven’t seen yet. Or go really fancy, and get a USB drive in a fully-customized shape/design of your choosing! Portable speakers: plug in, turn on. This is a great way to share music from your cell phone or MP3 player. Nothing says “rest & relaxation” like a spa-quality gift. Lotions, bath soaps, eye masks, scented candles, lip balm, and more. These products can be purchased as individual items, or in gift sets — some even with personalized carrying cases. Keep warm this winter with a custom blanket! I love giving (and receiving) blankets as gifts. There’s something just so nice about cuddling up on the couch with a soft, fuzzy blanket. I can never have enough of them! 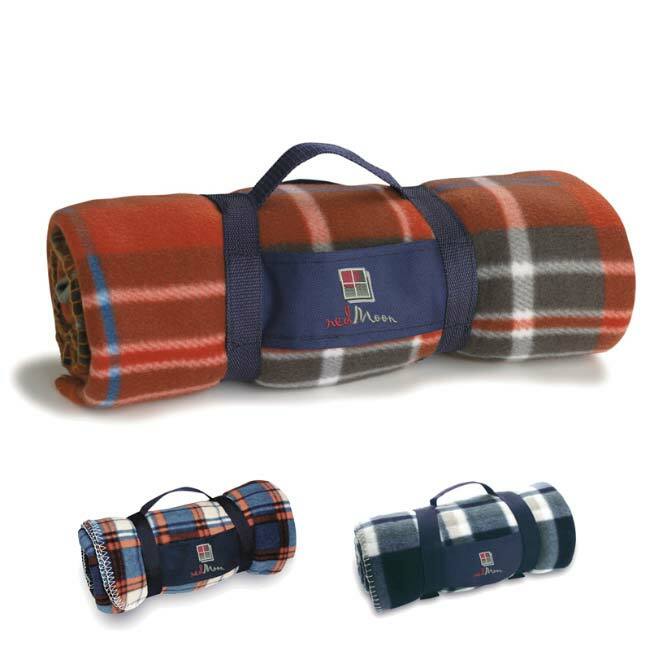 What’s really great is the variety of blankets available to you for customization as holiday gifts, with hundreds of options to suit your style or budget. From a simple fleece throw, to a flannel-lined lambswool blanket — or maybe even a vinyl-lined picnic blanket, given in anticipation of the first good weather of the new year. Portfolios (or padfolios) are a business staple, and there’s a reason why these classic items are still a popular choice. They come in a variety of designs and styles to suit every taste — and budget. Calendars are another one of those useful gifts that people will keep handy year-round. You’ve probably done it yourself: received a calendar in the mail from a realtor or dentist and hung it on the fridge because, hey, you needed a calendar anyway! We can help you design the perfect custom calendar for 2013. They’re great for employees and clients, alike, and will be a useful gift (and a reminder of your name, brand, and generosity) for a full 12 months. Who doesn’t like chocolate? Delicious and oh-so-festive, chocolate is a time-honored way of saying thanks and holiday cheers. What’s great about ordering chocolates is the range of options available to you, for just about any price level. You can go fully-customized, with a mold designed to imprint the chocolate bar itself with your logo or message — or use a stock candy bar and cover it with just a custom wrapper. There’s also chocolate coins, candy boxes, mint tins, and more. The possibilities are endless — just like your sweet tooth! It’s no secret that the holidays are an especially magical time of year for the little ones — so why not embrace your inner child with gifts for the kid in all of us. We love the idea of plush animals wearing custom-imprinted t-shirts. 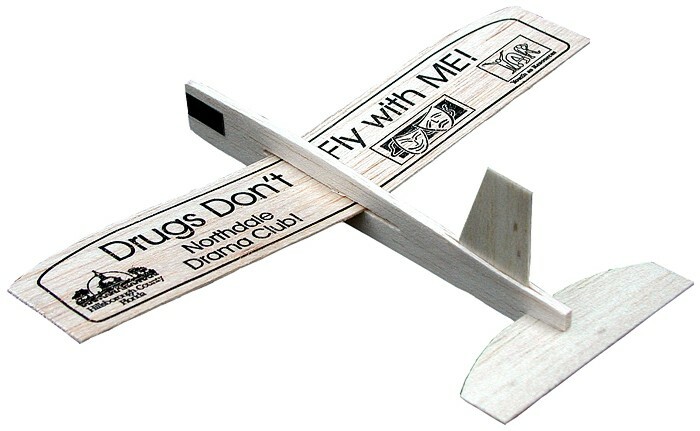 And who doesn’t love those balsa wood airplanes? 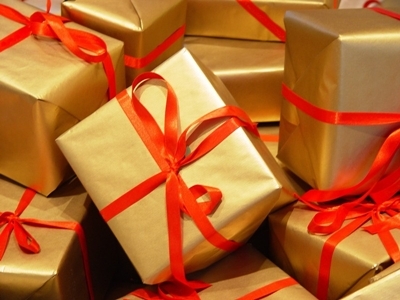 For the comments: What are your favorite gifts to give (as a company) or receive (as an employee or client) for the holidays?